Charting in WPF is supported by an extended library. This article demonstrates how to draw area charts in WPF and C#. WPF does not ship with default charting controls. Charting functionality is supported by WPF Toolkit that was last updated in 2010. You can download the latest version of the WPF Toolkit here. The WPF Toolkit data visualization assembly is called System.Windows.Controls.DataVisualization.Toolkit.dll that hosts the charting functionality in WPF. This article demonstrates how to draw area charts using the WPF Toolkit. 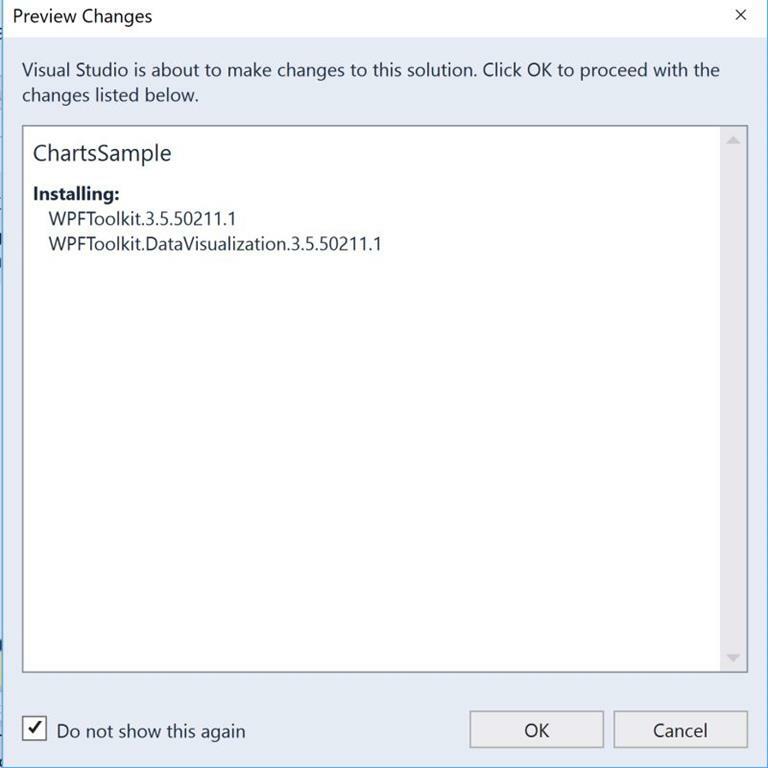 Before you can use any charting related functionality in a WPF application, you must download the WPF Toolkit. Create a WPF application using Visual Studio or use an existing app. 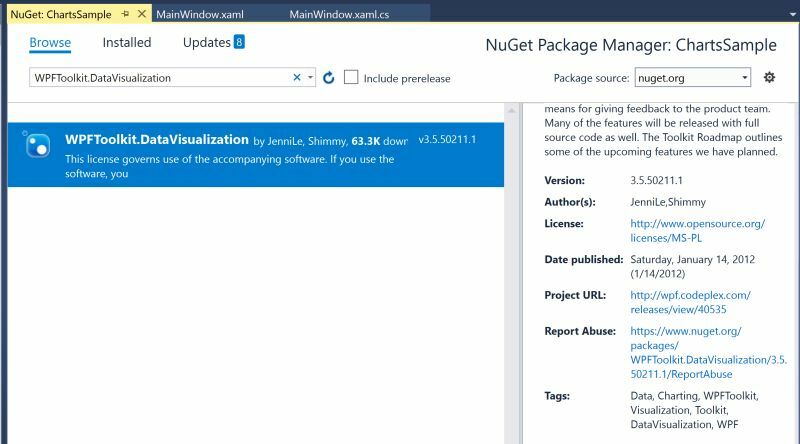 Right click on your project name in Visual Studio and select Manage Nuget Packages menu item. It will launch the following dialog where you click on Browse tab and type WPFToolkit.DataVisualization. It will load WPFToolkit.DataVisualization package in the list. Click on the little download and install icon. See Figure 1. Next screen Figure 2 shows what is being installed. Click OK and accept on the following screen. This action will install WPF Toolkit in your project. Once the Toolkit in installed, you need to add reference to the System.Windows.Controls.DataVisualization and Charting namespace references to the project. For charting functionality, you just need the Chartign namespace. See Figure 3. Now you will see the DVC in your XAML and code is availalbe to use. Once you type DVC in your XAML and use ., you will see Intellisense loads all available controls. To add a Chart control to your page, just select the Chart control from the list. The list of charting related elements looks like Figure 4. The code snippet in Listing 2 creates an area chart by setting Chart.Series to AreaSeries. As you may see, the binding is occurred on Key and Value fields of a data source. The Axes property of Chart is used to add x and y axis to the chart. The code snippet in Listing 4 adds a linear axis to the chart with its orientation, title, font and other properties. Now we are going to generate a bar chart from a collection. I have a class Fruit that looks like Listing 5. It has two members Name and Share. Listing 6 is a Fruit collection class that adds some Fruit objects in the constructor. Now in our XAML code, I create a resource called FruitCollection and bind it to the AreaSeries using the ItemsSource property as listed in Listing 7. XAML code for binding a FruitCollection with an AreaSeries is listed in Listing 8. Now simply build and run the project. New output looks like Figure 8. This tutorial discusses how to use WPF Toolkit to create an area chart.